Created as an extension of the World Entrepreneurship Forum (WEF), which was launched in 2008 by EMYLON Business School and KPMG, JWEF is a global community of students and young entrepreneurs.Cradle, which represented Malaysia at the WEF 2012, first mooted the idea of introducing JWEF Chapters around the world as a global connectivity platform for youth entrepreneurship. 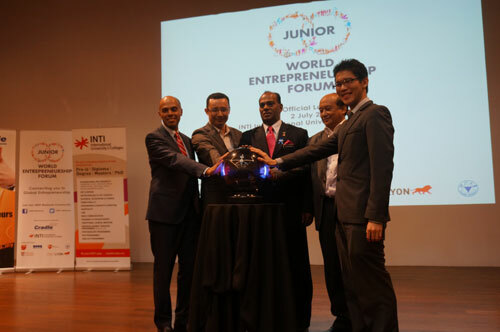 The launch of the Malaysian chapter at INTI International College Subang,stems from this proposal, which will now see an estimated 15 JWEF chapters being launched globally by the end of 2013. Similar chapters have already been established in Singapore and Shanghai.The JWEF Malaysian Chapter presents an opportunity for local youth to imbue themselves with a global mindset and create better visibility and connectivity with their peers from around the globe. INTI’s participation as a strategic partner to Cradle is even more symbolic as the first Chairman of JWEF – Michael Teoh – is an alumni of INTI International College Penang. (from left) Amit Sevak, Nazrin Hassan, Datuk M. Saravanan, Dato’ Sallehuddin, Chairman, Cradle, and Michael Teoh. The initiative is aimed at spreading entrepreneurial spirit in all fields of society and to create a platform for students and young people to meet with entrepreneurs, social entrepreneurs, politicians and academics to share their success stories, latest findings and insights in order to think of a new model of society that supports the growth for entrepreneurship. It focuses on a novel entrepreneurship concept of management, sustainability, social enterprise, community living and philanthropy. (from left) Shaun Lee, Gary Choong, and YusnoYunos. “Entrepreneurship to me means recognising opportunities and the passions of people and to integrate their drive in a collective goal. The initiative is designed to inspire, challenge and empower entrepreneurship mentality amongst its participants, inculcate the culture of working as a team, and the sharing of ideas with a wide network to reach common goals and dreams, ” said Nazrin Hassan, Chief Executive Officer of Cradle. ‘We believe Malaysians have all the potential to Go Global, whether it be through their business expansions overseas, export of locally developed products and solutions or even transfer of expertise and knowledge of our talents abroad. Leveraging from JWEF’s global networks of over 15 chapters internationally and being the subsidiary body of the World Entrepreneurship Forum (WEF) based in 70 countries, we believe we will provide the platforms, resources and exposure for our young entrepreneurs to think and go global from Malaysia!’ remarked Michael Teoh, Chairman and Advisor to JWEF Malaysia. 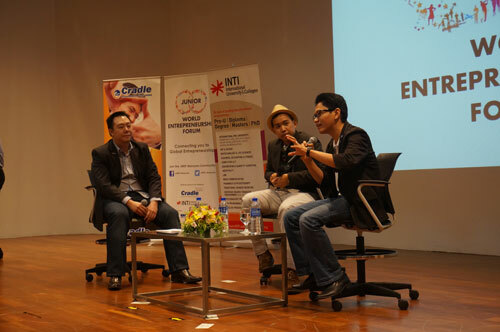 Moderated by Teoh, the Forum on ‘Inspiring Malaysian Entrepreneurial Potentials to Go Global!’ was discussed by Shaun Lee, co-founder of MilkADeal.com and Cradle entrepreneur, Gary Choong, award-winning producer, musician and film-maker and YusnoYunos, CEO and Founder of Y UsSdnBhd and Cradle Entrepreneur. The Forum provided participants the opportunity to experience a variety of shared thoughts with young and successful entrepreneurs from different backgrounds. “JWEF Malaysia is in line with the efforts of the Malaysian Government to transform our country into a fully-developed and high-income nation. We only have seven years left before 2020, the young generation will be the country’s future leaders and will play a vital role in ensuring Vision 2020 becomes a reality,” added Nazrin.